I’m brand new to this forum as I just purchased a 2018 Elantra Value Edition. I am not satisfied at all with the halogen headlights as my previous Mazda had Hid. I knew I’d want to upgrade them to an aftermarket bulb kit. I am wondering if LED or HID would be better? I had an HID kit in my 2012 Kia Optima that was great for awhile then randomly started shutting off while driving. Also I noticed the Elantra indicates if the bulb is blown out, and with the lower current draw I’m guessing this could be an issue. Could someone please direct me to a decent output LED or HID kit that’s going to be reliable and have no bulb outage errors? So generally you shouldn't run HID or LED in halogen reflectors, but the 18 Elantra has projectors correct? If so, you're best off getting a quality set of 35W HIDs. They WILL eventually ruin your headlight internals, HIDs put out UV light that burns the chrome reflective coating inside the projector. But if you get the right kit, it'll be a very slow process (vs a very fast process with cheap stuff). I suggest a XenonDepot Xtreme HID kit. The bulbs use real Philips quartz glass which filters the UV, so it won't damage your headlights nearly as quick. Plus they're the brightest bulbs I've tested (testing is here on HIDP). And the ballasts are really good as well. LED tends to be hit and miss with most headlights. As far as bulb outage errors, I'm not sure. You'd have to contact XD for that info. 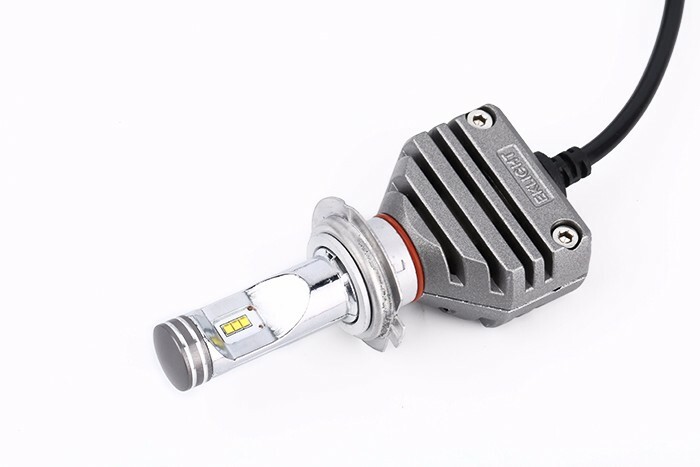 Currently there is no LED headlight bulb kit that surpasses the intensity that an HID kit provides. An HID kit will have more distance light and generally more light all around however in a halogen projector there will be more glare and lots of foreground light. The glare generally will be just at or around the maximum allowed levels as defined by the FMVSS 108 regulation. Foreground light will exceed the regulation levels. And yes, you may or may not experience reliability issues with the ballasts and/or bulbs (depending on brand). Many will say they have never had issues while others will say they have. The fact is, its a 50/50 chance. With LED, while you don't have as much intense light farther down the road, you can still have quality light. And plenty more light than a bad halogen setup. The problem with LEDs is that 99.8% of the market has poorly performing designs. Not because they are not bright enough but because the LEDs are not aligned in a manner that provides optimal beam focus. There are only but a few that I can recommend to try out. Everything else and I mean everything else out there is trash. I don't care what chip(s), or how many lumens they claim to have or what technology its using, I've tested a bunch and I know which ones have the key ingredients to a good beam pattern. An LED with active cooling will have more power which means more light output. This also means potential reliability with the fan. However most designs have built in safety features in the event of a premature fan failure. What this means is that if for whatever reason the fan craps out, the LED driver module will automatically lower power output so that the LED can sustain itself in passive cooling mode. I had an LED setup in one of our vehicles that was actively cooled. I think we had it in there for a little over 2 years. It wasn't until I removed them to test another set of LEDs did I realize that one of the fans had failed. However to my eyes on the road, there was no difference in output between both headlamps. I have never experienced a failure of the driver module either however this too is a possibility. So as you can see both have their positives and negatives. And both have compromises. You just need to determine which is best for you. For a H7 LED, I would recommend the EKlight K8. It uses Luxeon Z ES chips on a double sided copper pcb. Good optical placement and great beam performance. You will need to buy directly from them HERE as I have yet to find any retailers that sell them in the states. Last edited by evo77; July 10th, 2018, 04:30 PM. Thank you. I’m guessing HID might be my best route as I’ve taken that one before. I can’t remember which company I’ve used before. Xenonsupply or Xenondepot both sound super familiar. Xenon something is who I used and had issues. Is there any other companies out there who are decent? The car does have factory halogen projectors. I was going to get the Sport model with the factory HID headlights, but couldn’t stand the seats and wasn’t willing to spring top dollar for the Limited with Ulimate package. I looked through my records and the ones I’ve had issues with were from XenonSupply. Is XenonDepot a decent company? I’m open to them now that I know I didn’t get the faulty ones from them in the past.